‘Feel Free’ has generally been received well in every country of release. very well attended. As to this being a breakthrough, only time will tell. French, did you make any encouraging in-roads with them this time? and the album actually scraped into the lower regions of the French charts. of days. Can you let us in on what happened there? alone to get on with our rehearsal. 4. Do you feel the U.S.A. has abandoned you? has been a success and in the long run, that is what really counts. 5. What are your long-range plans for the United States/Canada? To reactivate all that was begun in 95/96 and take things to the next level. you be looking for in a record company in the U.S.A.? 7. What happened to the songs you wrote with Steve Earle and Francis Dunnery? project I have in mind for “Statue Of Liberty”. what happened to you in America? Will we ever hear it again? love to perform it in New York City. witnessed by recent success ‘Twin Town’. your experience in 1996 with the USA. there is still ‘Hiraeth’ (longing) to come home. and if you are really Welsh. Could you clear this up for us? Bob Dylan tribute album on the Sister Ruby Records label? I don’t know, or should I say the answer is blowing in the wind. 13. Have you been consciously influenced by John Lennon’s solo albums? sentiments Lennon expressed on the ‘Plastic Ono Band’ and ‘Imagine’ albums. two particular favourites of mine. ‘The Message’ as a single and wanted to use ‘Shine On’ as a set up single. structures of both companies, the ‘Feel Free’ campaign had to be abandoned. “Rise”. Did he have any gems of advice to give to you or you to him? No, we just met at the hotel and talked music / life for a while. sound in a direction that you did not care to persue? extreme without having to resort to aural shock tactics. 18. Is there a chance that the MPO will release a CD of “Feel Free” outtakes? Speed/Luby mixes (‘Psychological Combat Zone’) might be interesting. completed, fully produced studio recording. this have anything to do with it not showing up anywhere else previously? ‘Love is a Revolution’ etc. albums. These plans seem to have faded. Are you still planning a volume 2? available in the not too distant future. 22: What songs might we see on “Second Generation Vol. II”? Noone knows what the rude boy knows. the music do the talking”? boundaries of a particular album sequence or musical time frame. film are mainly the songs that never made it through to completion. were some of the titles). 25. How close are you to opening an ‘Alarm’ theme restaurant in Rhyl? 26. What do you think some of the menu items would be? restaurant ‘Macdonalds’, but I don’t think it would catch on. then invited him to come onstage for a couple of songs and he accepted. 28. How did it feel to have Eddie MacDonald play with you again? pay their respects to Eddie since ’91. towards playing new music, and rarities from The Alarm era? of my own band and road crew. friendship soon resurfaced and has been active ever since. inspire any of your new songs? No. Although Eddie and myself may write some songs together in the near future. 32. Nigel Buckle has recently showed up on the internet discussion group. Nigel and hear his interpretation of past events. the internet discussions about The Alarm and related topics? openess that has sprung up around the internet. Circle”. Do you think he is finally moving in the right direction? Dave Sharp has always moved in the right direction as far as I am concerned. his version from memory or if he subsequently found it from another source. 36. What was the first Alarm song ever played? ever played in front of a live audience after leaving The Alarm? failure I only managed a few bars of the intro before having to break off. by George Harrison and then, problem solved, an electric ‘Poetic Justice’. to the song ‘Burning Down The Road’. a new Alarm ‘Best Of’. 40. Do you think there is really a chance of that happening? think this is the natural and logical home for this particular song. No, it was a way of expressing ourselves in an original manner. this sudden change in attitude towards the use of technology in music? (Besides your already stated “fear of failure”). sound/energy levels of our live concerts. more upset about the technology itself, or the way it was being used? The Alarm as an entity may have existed beyond 1991.
production techniques more than anything. your “musicians workbench” more than anything else? revolutionised guitar playing in the sixties. of the communication ideals expressed by the MPO. 49. Why has the MPO moved locations? Was your secret hideout discovered? and help us to expand the personal service which has been so well recieved. 50. What do you consider your greatest success has been in the past year? I believe it contains my finest work both written and recorded to date. milestone’s, a song of this nature seems to emerge. 53: There seems to be a few songs of the “Rebuilding” nature on “Rise”. your old clothes” while writing and recording “Rise”? space owing nothing to what has gone before. more willing to let people see the “whole” of your feelings? I’ve managed to keep my trousers on for ‘Rise’. Peters do these songs come from? Will we hear more? They come from the part of Mike Peters that has experienced 38 years of life. will build your career for forseeable future? for the first time. What exactly does this mean? I spent too much time trying to justify myself to anyone who would listen. inspired you to write this song? being as the most interesting lifeform in the universe. 60. Did you and Bully Duffy collaborate on “In Circles” ? the chorus and the lyrics on tour in France. a very “electric” atmosphere in the song that matches the lyrics dead-on. creates a perfect 60’/90’s soundscape. effect tool for creating atmosphere in your new songs? Controlled feedback can be a brilliant effect for creating atmosphere. the bridge on his Rickenbacker electric and the effect was stunning. to elaborate, or is it not a good time. The song is dedicated to Chris Anderson who was a great friend of mine. connection to the place in which I live and the surroundings I grew up in. any specific musical reference point, which gives ‘Rise’ a ‘British’ sound. It is true that The Alarm and myself had / have an affinity with the U.S.
were written for then, ‘Rise’ has been written for now. only describe as “a joy of just being alive”. Can you explain this? Listen to the lyrics of the ‘Feel Free’ album and I think the answer is obvious. ever written. Are you finding it easier to express this side of yourself? personal version of Hell? Heaven? weakness, rise and fall. ‘Ground Zero’ is an audio reality check. exit from The Alarm and subsequent solo career? feel to them – is this something you are deliberately exploring? become less of the former and more of the latter. that juxtaposed these elements, or is this mere coincidence? ‘Rise’ is not a concept album if that’s what you mean. there was any sort of lyrical continuity as well? lyric and mirrored in every sound. ‘The Wasting Land’ is a requiem of lost opportunity. British” attitude evident on “Rise”? are alive with the vitality of the present. other songs from your past which you will revisit? juxtapose these two differing styles? were you trying to create a sense of irony? So Mike Peters fans do pay attention to detail after all. songs on the album to elicit any sort of reaction from the listener? discern the relevance of such interplay. just take off with it, letting you sit back and be amazed? 80. How did you meet up with “Sentient”? ‘White Noise’ and get invloved in a few other tracks. 81: Did “Sentient” record any “alternative” mixes of the songs on “Rise”? Will we get to hear them? 82. Do you have any idea what might be the first single from the ‘Rise’ album? 83. Have you decided on a record company for the UK? 84. Do they have an outlet in the USA/North America? months before it is due? Good, I can now get on with the next one. 86. 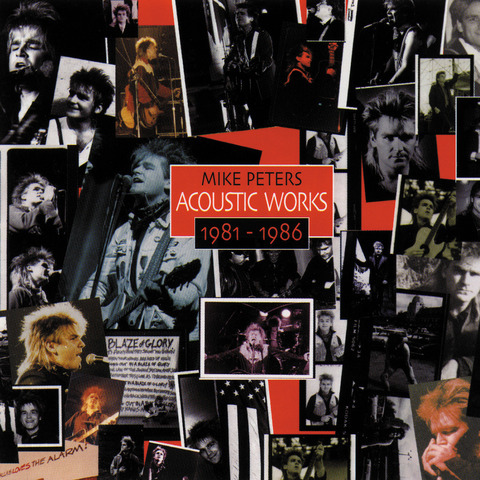 Does Mike Peters have music running through his head all the time? by the drug of music. 87. How many songs have you written for your next album? 88. How do you like working with Billy Duffy? work ethic as myself. We feed off and give out a very similar energy. 89. Were you aware that Mr. Duffy was such a good soccer player? his support of Manchester City. Billy Duffy? What did you think? footage though. I’m usually too busy trying to catch up with today. playing and recording demos for a possible project. How did this go? All will be revealed in the fullness / nearness of time. 92: Which other musicians are you considering to join you for this project? 93. How serious are you and Billy Duffy about recording and touring? 94. What is the purpose of your new EP? Why did you want to release it? intentions and at the same time, announce the shape of things to come. would it feel to finally release that song as a single? we have to until for 1998? they have to have time to breathe. moved off in place of ‘My Calling’, and put on your EP. Why was this done? ‘I Want You’ was actually recorded with the ‘b’ side of a single in mind. think you would be feeling right about now? along these lines knocking around inside your head, or archived on tape? kicking around, and if so, when will we get to hear them? turn up at some time but when and in what form remains to be seen. and this is what I have attempted to convey with these new albums. not an 80’s band” is a true one? Why or why not? the future by and through the activity of it’s members as individuals. Yes. I have only recorded songs I actually had a hand in writing. significance other than a convienent way to divide the two albums? 106. What inspired you to create the “Red” and “Blue” albums? which I believe the acoustic backing provides. year, will “Second Generation Vol. II” still appear for the Gathering 6? No. We’ll have to wait for that one. 108. Do you have anything special planned for G6? band for the first time in 6 years? to achieve the right balance for myself and fans alike. that other musicians will take their place. Is this true? 112: Do you have any final words or comments about anything we have discussed? A Love of life, and a life of love.